List contents, tape one copy inside lid of box and insert one into Evacuation Plans binder. Categories: Emergency and Disaster Response, September 2015 | Permalink. Distance: plan to be far enough away to be outside the disaster zone, but not so far away that rebuilding your life at home is unnecessarily difficult. Suitable for your needs: must accommodate the size, ages, medical needs of your group. Safe: you may need to temporarily leave behind property and family members while you work on rebuilding your life at home. Contact location and consider sending supplies on ahead: ask questions, offer reciprocity, work out as much as you can in advance; some people will feel better knowing that you are planning to provide for your own needs and won’t mind if you keep a couple of boxes in their garage. 2. Prepare your vehicle. Know how to check fluids, tire pressure and adjust seating; have supplies on hand for topping up fluids, cleaning windows, inflating/repairing tires. Purchase at least one five gallon gas can and plan how you will secure it on the outside of the vehicle. Assemble these items to keep in your car at all times: quality jack, basic tools and spare tire; tire plugs or other means of dealing with damaged tires; jumper cables; umbrella/raingear; reliable flashlight/headlamp; gloves—both work and cold-weather; baby wipes (remarkably versatile); triangle road markers; fire extinguisher; wd-40 or Break-Free CLP; duct tape; small shovel and piece of old carpet (for getting out of snow/mud); roll of saran wrap (for broken or stuck windows); tow strap rated for your vehicle weight; drinking water. Habits: Refill your gas tank any time it is less than ¾ full, and stay on top of regular maintenance. Categories: August 2015, Emergency and Disaster Response | Permalink. 60-second evacuation: house fire or other fast-moving catastrophe—requires you to leave your house with just the first thing(s) you can grab and a pair of shoes. 1-hour evacuation: approaching wildfire or slower-moving catastrophe—you have a little more time to secure your home and gather belongings. 12-hour evacuation: Approaching danger, such as a hurricane—more time to secure and gather. 72-hour evacuation: Slow-moving disaster, think weather systems again—time to make purchases, harden your home against weather or ill-intentioned humans, secure or hide belongings to be left behind, map out evacuation routes , etc. Over the next couple of months, we will discuss how to plan for each of these. This will fall into the same basic pattern for everyone and it will need to be memorized so that you act automatically. In the case of a significant house fire, you will have less than two minutes to safely evacuate (click here for video illustration—note the time between the sounding of the smoke alarm and the complete destruction of the room) and this is not enough time to think things through and make decisions. Have every household member who is able, memorize the steps in bold and then drill regularly. If you have small children, quarterly drills are recommended as little ones will often panic and hide in a crisis situation. Sound the Alarm. Use any possible means to get everyone’s attention as quickly as possible. Make sure that you have a smoke alarm in every bedroom and on every floor. Communicate. Decide how you will alert the members of your household to danger. Describe the emergency and give directions in as few words as possible, such as “Fire! Get out!” or “Earthquake! Mail box (see #7)!” and repeat until everyone has heard and followed directions. Are Children (or physically disabled) in Danger? Can you safely retrieve your 72-hr (backpack) Kit? ESCAPE! Draw a simple map of your dwelling and determine 2 exits to every room. Purchase equipment, such as fire escape ladders, and trim (or plant!) surrounding shrubbery to make window escapes as safe as possible. Make sure that these exits are always accessible and not blocked by furniture or other items. Meet up. Establish a safe meeting place, out of the way of potential emergency vehicles, but close enough for everyone to reach quickly so you can be sure that everyone got out. *See the 72-hour Kit segment in this month’s newsletter for instructions on assembling an appropriate kit for a 60-second evacuation. Categories: Emergency and Disaster Response, July 2015 | Permalink. As the foundations underpinning society are stripped away, the world becomes a more dangerous place. While it may have been a remote possibility at one time, it is increasingly likely that during our lifetimes, we will encounter some type of dangerous civil unrest. The suggestions below may help you and your loved ones weather such events safely. Be prayerful. The Spirit will alert us to dangerous situations if we will hearken. Pay attention to what’s happening in the world and especially in your area. Stay on top of the news (even when you’d rather not) so that you know when people are upset and where they are congregating. If there is a particular group that is problematic in your area, you may consider following them on Facebook or Twitter. Most gatherings are not spontaneous and much of the planning takes place on social media. If you know there will be problems, stay home or at least away from problem spots. If violence is likely to be near your home, it is still usually better to harden your home and stay put as long as possible. Consider carrying pepper spray or some other weapon as part of your Every Day Carry. Carry a 72-hour kit in your car whenever you are away. If you have the necessities of life, you simply have more options. Make sure that you have a paper map and/or know multiple routes home so you can avoid trouble spots. Improve your situational awareness. When you walk into a building, locate your exits and pay attention to the people around you. If somebody is acting suspiciously or something seems wrong, trust that feeling. Remember that law enforcement is there to deal with the mob, not to protect you. It is up to you to protect yourself and your loved ones. If you are in the middle of the group, work your way out to the edge. You are more likely to be crushed, trampled or dragged in the center. Avoid becoming trapped against a wall or fence or pushed into a corner. If objects are being thrown, get well behind the launch points and find cover. Blend in and then get out. Anyone who stands out is likely to become a target. Obviously, don’t participate, but if everyone is chanting or waving their fists in the air, chanting and waving along with the crowd might just keep you unnoticed long enough to get to safety. Categories: Emergency and Disaster Response, June 2015 | Permalink. I recently read an account of a woman who had spent a great deal of time, energy and money to build up her supply of food and other essential supplies only to have a large percentage of her things destroyed in a plumbing-caused basement flood. It was not that she was careless, but her situation revealed weaknesses in her storage systems that she had not anticipated. Fortunately, her disaster was very localized—she saved what she could save, worked on rebuilding what was lost and learned from the experience—but in the case of a widespread natural disaster, we may not have the same luxury of a do-over. Below are some steps you can take now to preserve your preparedness investments. Don’t keep all your eggs in one basket. 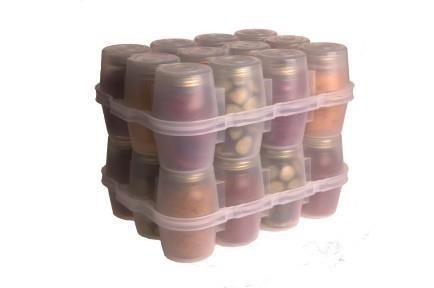 Divide your food storage and supplies and cache them in various places around your property. This decreases the likelihood that everything will be lost. It might not even be a bad idea to store some things offsite in a storage unit, cabin or even at a friend or family member’s house if, particularly if you have arranged to evacuate there in case of an emergency. 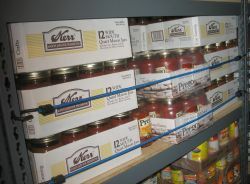 Use wooden bars, straps or bungees to keep items on shelving units. Many of this woman’s losses could have been prevented if items had not fallen from the shelves. Also, use non-slip liners on shelves and baby locks to keep cabinet doors closed. Anchor free-standing shelving units into wall studs. Package items to withstand both water infiltration, falls and abrading and crushing forces. For instance, vacuum sealing is great waterproofing but it is quickly compromised by a run-in with a sharp or rough object. Placing several vacuum-sealed items together in a five-gallon bucket or large plastic tote will provide more reliable protection. Filling the empty spaces with newspaper or packing peanuts will provide even better protection. 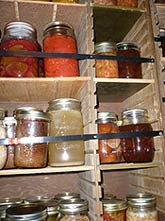 Other tactics to consider include clear-coating metal cans to improve water resistance and purchasing plastic JarBoxes to contain and cushion your canning jars. Consider below-ground or safe-room storage if you live in a tornado or hurricane prone area. Underground storage may also be a good option for wildfires. Throw out any opened packages; any permeable packaging (even if it appears dry); any metal cans that are rusted, bulging or have dents along the seams. Also, throw out any item with one-piece screw on lid that does not have a sturdy interior metalized vacuum seal—mayonnaise, salad dressing, and peanut butter are often packaged this way. Dirty water will seep up into the threads and cannot be decontaminated. 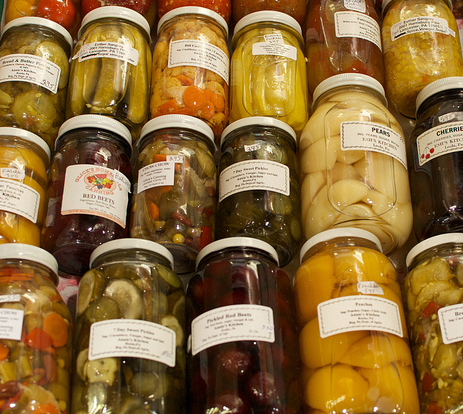 Thoroughly check home-canned food with two piece lids. If seal is good—decontaminate, if broken—discard. 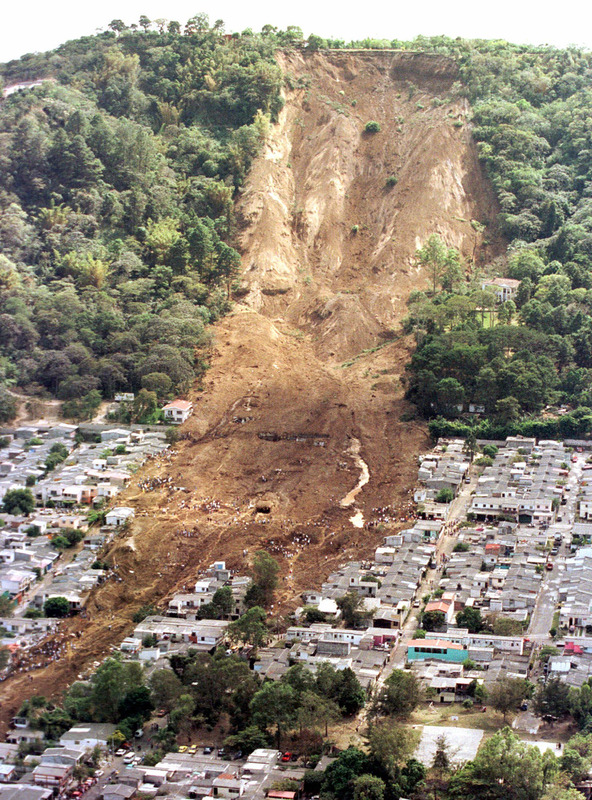 Categories: Emergency and Disaster Response, May 2015 | Permalink.